"I was actually ejected from that tournament screaming in protest. It was supposed to be a shootout that was 9, 10, or 11 handed. The rules and the structure that they displayed and printed were rather ambiguous, though, to say the least. After sitting down, we started playing and after 15 minutes, they decided to take out four of the stacks from each table, which meant that we were going to be playing a 6-handed shootout. That was a drastic change from the structure as published and I asked for a floor person to come over because I was not happy with this dramatic change despite the fact that I am well-suited to short-handed games." "The floor person came over and I told him, 'This is outrageous, this is disgraceful, it's not fair for the players and I want a refund.' The floor person told me, 'Well you aren't getting a refund.' I said, 'Well I'm not going to play and I want a refund.' He picked up my chips and said, 'You're out of the tournament.' He never gave me a warning or anything, I didn't swear, I didn't threaten anyone. I was screaming and shouting because I wasn't happy about it because as far as I was concerned, it was very disrespectful for the players, and I think I had a lot of support from the other players as well. "I said I want to see a senior tournament official brought here now or [WSOP Commissioner] Jeffrey Pollack, I want to appeal this decision and I don't think it's right. They escorted me out of the hallway and I repeated myself, but the response I got was they're too busy to see you." "Every player has a right to appeal any decision of the floor to a higher authority. It was totally outrageous, they kept me waiting for 45 minutes. Finally, one of the senior executives from the WSOP came to see me and explained that [the change] was in their rules. He got the rules sheet out and it wasn't clear in their rules. He acknowledged that they made a mistake in evicting me and asked if I wanted to be reinstated or have my money back. I told them I could not support the event and asked for my money back, which they gave me. "Subsequent to that, I had a meeting with Jeffrey Pollack to shed some kind of light on the communications to prevent things like this from happening in the future. I think it was pretty positive – it would have been nice to isolate specific incidences but I didn't feel it appropriate to bring it up in that meeting. Tony Bloom, John Gale Brian Wilson, and I tried to stick more to the general idea of fixing the channels of communication. It was a very promising meeting, they acknowledged that they did make mistakes and they would try to fix them. The biggest thing was they agreed to make a player's consultation booth where players can go up and speak their issues. I don't think they're aware of how strongly we feel. "I'm already paid in for the main event, but I'm probably not playing in any other events. In future years, I don't know. I'd dearly love to win a bracelet. I've made final tables here before, haven't managed to get one yet and it's not the end of the world if I don't. 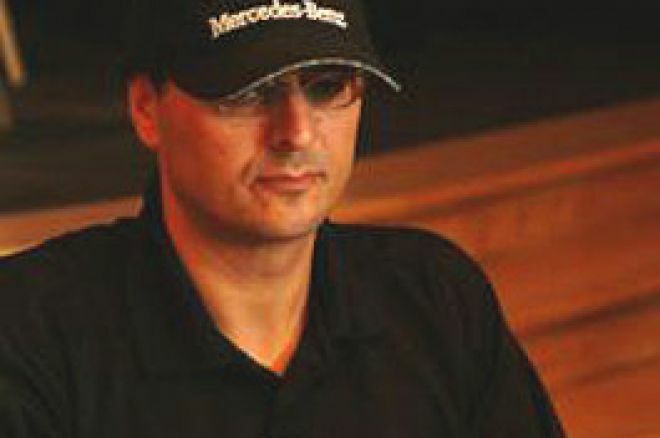 If it seems to improve and they listen to players, I will play in events – if they don't, I'll just stick to the WPT. "It is not easy to put on an event with this many people, so you have to give them credit for that. The problem is lack of understanding. We don't have enough information. We hear these rumors about how much they're being paid by PartyPoker, Milwaukee's Best, Corus Watches, ESPN - We don't know if they're true. We hear these big figures, big sums that are probably being inflated, but we want our cut as players. Bottom-line, they're going to make profits, but are we entitled? They've made improvements, but they're just scratching the surface right now." Ed note: Scratch the surface of your bankroll every day at Party Poker.